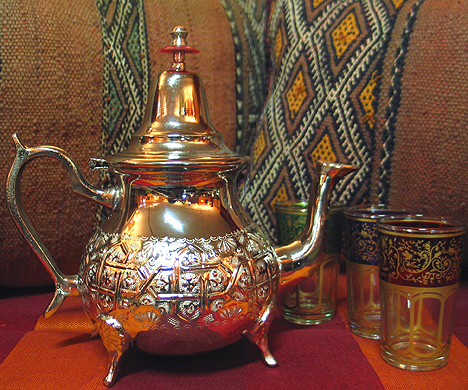 This silver teapot is made in Morocco to be used to prepare hot Moroccan mint tea, it has beautiful designs. Easy cleaning with Wright's Silver Cream or other silver cleaning products found in many hardware stores. This teapot can serve 8 glasses of the ones we have online. You want to allow about an inch and a half to two inches of empty space in the glasses to hold them from since tea could be hot. Check out our culture & recipes for a free Moroccan tea recipe.